Three of Rep. Grier Martin’s bills benefiting North Carolina’s military community became law today. 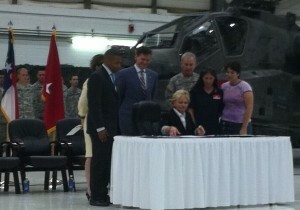 In a ceremony at the National Guard Armory in Morrisville the Governor signed HB76, HB412, and HB614. HB76 helps ensure that servicemembers wishes for the disposition of their remains will be followed in North Carolina. HB412 modernizes the military justice laws that apply to the North Carolina National Guard. HB614 further improves the ability of deployed servicemembers to vote in elections. Rep. Martin previously passed legislation that significantly made it easier for those who defend democracy to participate in it. This entry was posted in Feature, Uncategorized and tagged military/veterans. Bookmark the permalink. Post a comment or leave a trackback: Trackback URL.